OMDC-MD10P controllers are used with linear encoders for precise speed control in Omega's manufacturing process for metal sheath thermocouple wire. Sample Application: Synchronized conveyor controller with jog switch, the slave conveyor 2 will follow changes in speed made to the master conveyor 1. The jog switch allows positioning of conveyor 2 when system is stopped. The OMDC-MD Series is a compact, programmable DC speed control with digital closed loop feedback and LED display for DC motors rated to 2 horsepower. An on-board microprocessor with non-volatile memory, coupled with sophisticated internal software, makes the OMDC-MD series speed control the ultimate value in accuracy and control. Programmable parameters include maximum and minimum set speed, decimal points, and operating mode (master or follower). 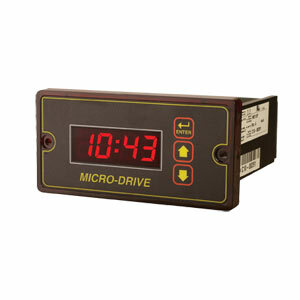 The OMDC-MD series speed control is simple to operate: set the desired RPM, rate, or time in the large 1/2" LED display by depressing the “Up” and “Down” pushbuttons on the front panel. Settings can be one digit at a time or fast sweep. The OMDC-MD series speed control settings are exact and repeatable. It will precisely control speed to ±1/2 RPM of set speed, long term. No calibrations of the control are necessary. The OMDC-MD speed control is available in both 1/8 DIN and 1/4 DIN industry standard cutout dimensions, providing easy panel installation. These DC motor controllers can be set to RPM, FPM, GRP, process time, or any other engineering unit for easy operation. NOTE: Speed feedback is required (encoder). Recommended: OMDC-PU-40E (see below).